Combine 2 cups flour and yeast. Heat and stir milk, sugar, ⅓ cup butter and salt until warm, and butter is almost melted. Add to flour mixture along with eggs. Beat for 3 minutes or until mixed. Knead in enough remaining flour to make a dough that is smooth and elastic. Place in a lightly greased bowl, turn once and cover. Let rise in a warm place until doubled (about 1 hour). Roll one of the divided halves into a 12x8 inch rectangle. 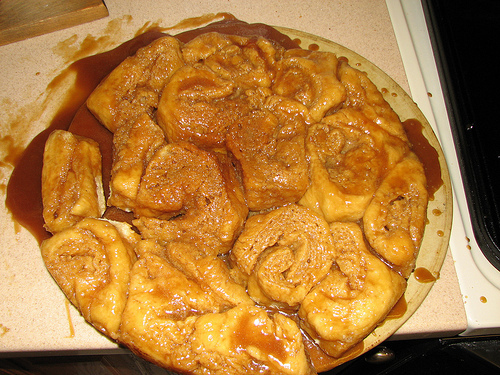 Melt ¼ cup butter and mix with brown sugar and cinnamon. Brush half of mixture onto dough rectangle. Roll up from long side. Place rolls into greased 12 inch Dutch oven. Cover and let rise until double (about 30 minutes). Use 8 coals under and 18 coals on lid, bake at 375 for 20 to 25 minutes. Cool slightly, remove from oven.